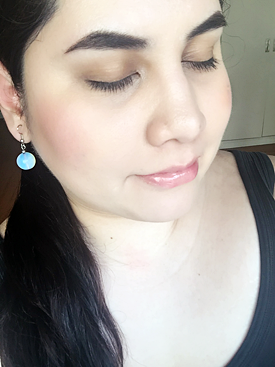 Ari's In Wonderland: Hourglass Ambient Lighting Blush in "Diffused Heat"
Hourglass Ambient Lighting Blush in "Diffused Heat"
Joining blog giveaways was something I was, and still am, very much into. I mean, what's not to love? Not only do you get to show support for a blog or blogger you like, you get a prize out of it too! I'm happy to say that I've won quite a few prizes already, and one of my absolute favorites is the one I won from Claudia, the lovely gal behind Beauty and the Chic. She was even sweet enough to include a handwritten card with it expressing her thanks. 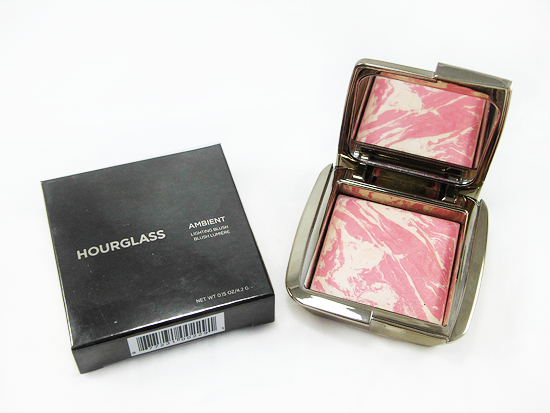 Of course that prize was none other than the much talked about, much coveted Hourglass Ambient Lighting Blush in one of its most popular shades - "Diffused Heat". I've had this blush for a long while now and it's one of my absolute favorites! Hourglass says this is... "A truly multidimensional blush that enhances cheeks with seamless, soft-focus color, and a natural radiant finish" that is also "paragon free, talc free, fragrance free, nanoparticle free, gluten free". 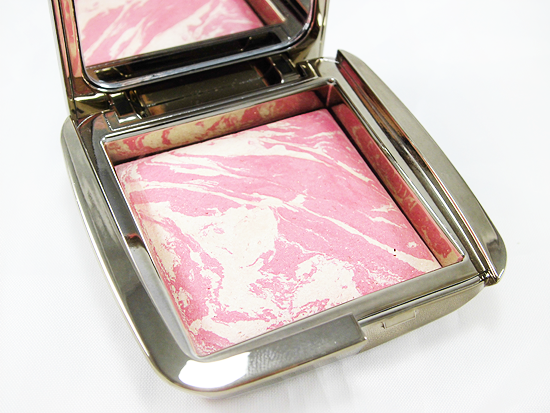 Read on to find out why this has become one of my definitely-must-have blushes! The blush comes in a sleek, metallic gold compact with a mirror finish. I've had this blush almost 2 years already and the compact still looks as good as new! No fading or chipping on the label either. 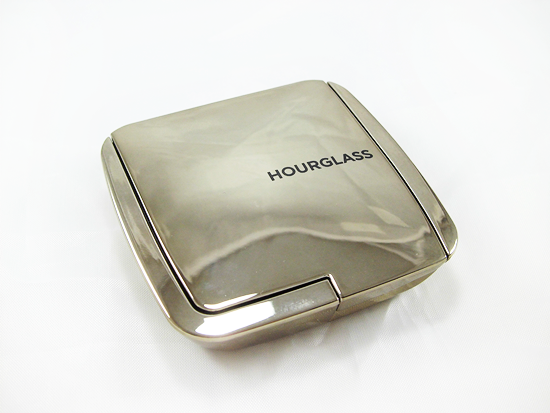 As a high-end brand, Hourglass really delivers when it comes to their packaging. 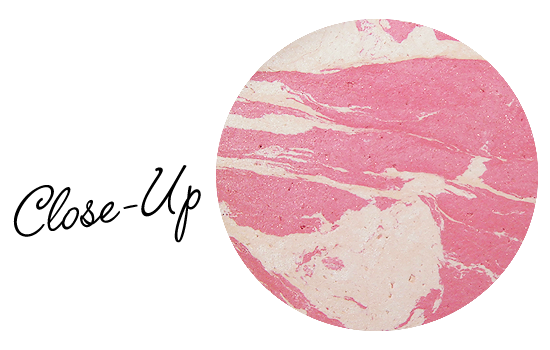 The secret to these blushes is simple. It's a fusion of their just as loved Ambient Lighting Powder, the white(-ish) parts you see there, with vivid cheek colors. According to Too Faced, "the hand-made powders are formulated using an advanced miscelare technique...creating the perfect balance of pigment and powder..." Plus, no two blushes look the same! I know most people steer clear of any blush with shimmer (or straight up glitter) particles infused into it. While I tend to do the same, this blush makes for an exception because it only adds to wonderful effect of the final finish. The shimmer isn't in huge chunks either, in fact they're really small, and they're finely spread out too. Thanks to the combination of the Lighting Powder, pigment, and shimmer, you're left with a blush that's not only pigmented and vibrant looking, but has a soft focused finish and really adds that touch of radiance and glow to the face. The 'Photoluminescent Technology' that Hourglass incorporates into it adds unique dimension as well and you're not left with just an ordinary, 'flat colored' blush. Capturing the true color of any blush proves difficult for almost every blogger, no matter how great your lighting or equipment is, but I think I came very close with this! With that said, it is a teeny bit darker than what you see here. The blush has a very soft texture, much like the Lighting Powder itself, which makes applying and blending it out easy provided you don't pack on a lot of it onto your brush at once and gradually build it up instead. Considering how pigmented this blush is already, you really shouldn't load up your brush with it in the first place and it won't take much effort to get its true color to show up on you! If you have a darker or deeper complexion, you'll probably need to spend some time building it up, but on my NC25 skin it can easily look overdone so I have to be careful and take my time with it. The softness of it also means it's quite powdery and you can accidentally pick up too much product, especially if you use a denser brush. For the best application, you'll have to combine a light hand with a brush that doesn't have such tightly packed or compacted together bristles. Christine from Temptalia.com recommends a stippling brush, but I find I'm able to apply this just fine with my Real Techniques 300 Tapered Blush brush. You'll have to do a bit of experimenting to find out which brush works best for you! 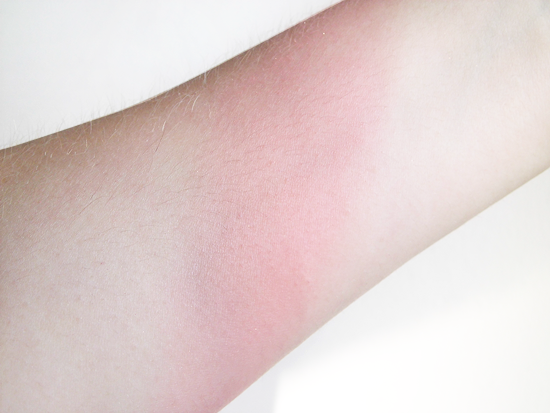 Speaking of brushes, this is what mine looks like after using the blush to apply a lot of it on my arm for swatching purposes. Like I said, the blush's soft texture results in it being quite powdery, so if you're not using a light hand it'll really get all up into that brush's business. It'll also leave a bit of a powdery residue mess within the compact if you're doing any sweeping and swirling to pick up the blush, that's why I like to lightly pat my brush onto the blush to not only get just the right amount of color, but to also make less of a mess. 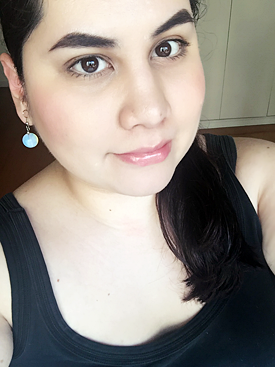 Finally, here's me wearing the blush! I like how it looks quite natural if I apply it properly and almost mimics the color of my natural flush. To make sure the finish and look is kept soft, after lightly patting the brush onto the blush, I then just as lightly pat it onto my skin and all around the specific area where I want the color to be. From there, I blend away. Again, you'll need to experiment to find the technique that makes the blush look nicest on you! 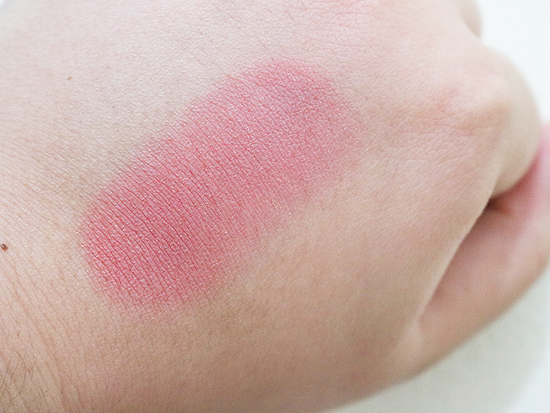 The wear time of this blush is also impressive as it lasts virtually all day. Even if I apply this in the morning, combined with occasions of sweating from the heat, come evening most of the blush still remains intact and there's only some fading at most. It lasts even longer, and there is even less fading, if I use a good setting spray after application. This Ambient Lighting Blush was my first Hourglass product and it's safe to say that it won't be my last and I'm excited to try out more from them as this one gave a pretty stellar first impression. I already have the Ambient Lighting Palette as well so I'm excited to review that next! Paragon free, talc free, fragrance free, nanoparticle free, and gluten free. Soft texture means too much product can be picked up and can leave powder residue within the compact. Apply with a light hand and the right brush. 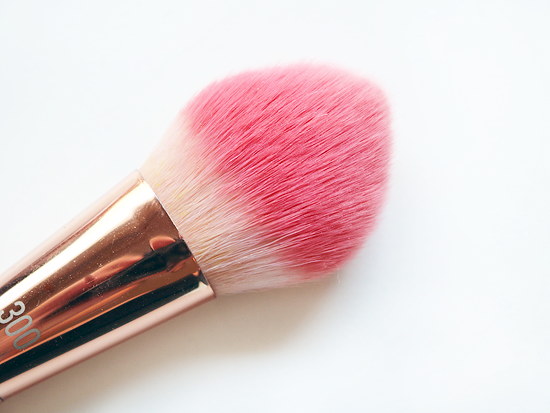 Use a patting motion on the blush to reduce mess. Buildable if applied lightly each time. Leaves a radiant, soft-focused finish if applied properly. Wear time is good and can last for hours, even without a setting spray.